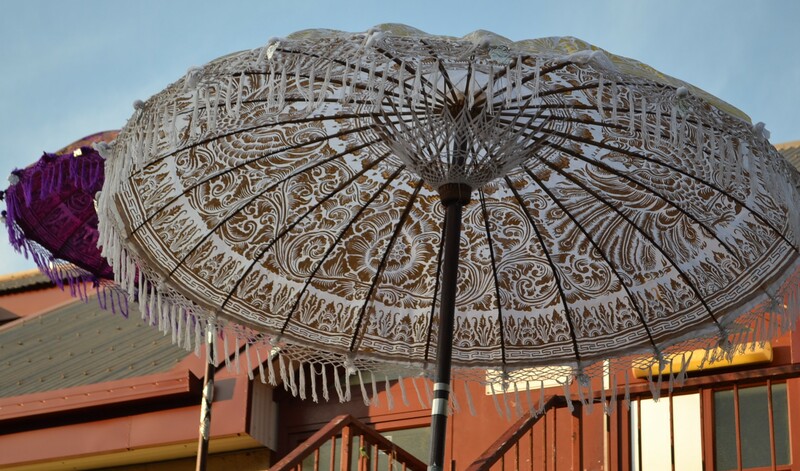 Yes, I know, it’s Umbrella Glamour…seen at the Little Indonesia night at Festival Park. 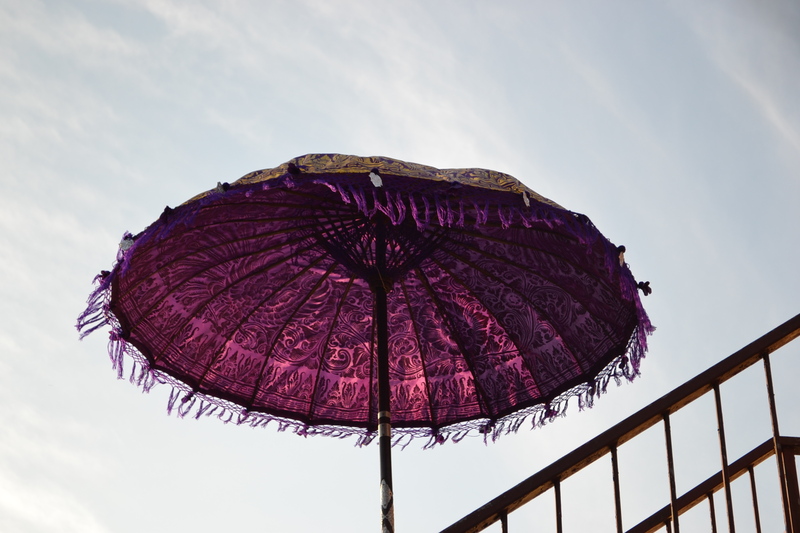 Don’t you love the pattern on the umbrella fabric? 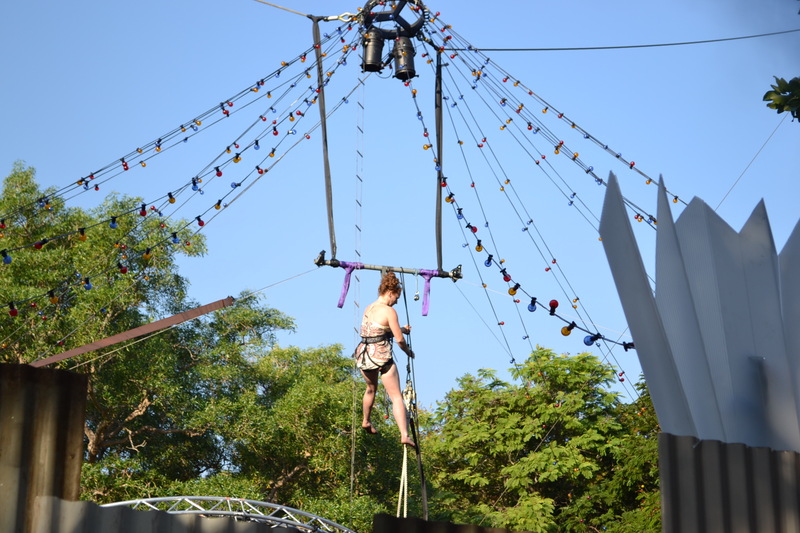 Sunday night was the finale of the Darwin Festival which we’ve all been enjoying. We went to see the final concert, Black Arm Band’s Dirt Song. The band is a collaboration of Indigenous artists. Dirt Song is an anthem to country and the intrinsic cultural ties Aboriginal people have with their place. All songs are in language (11 different ones to be exact) and although most of the audience would not have been able to understand the words, the strength of feeling throughout was evident. The words are based on the writing of Miles Franklin Award winner, Alexis Wright. The performance, though it seems almost glib to call it that, was a formidable and intriguing balance of traditional and modern. Although conventional instruments formed the underpinning of the band’s music, the tune and tenor of the music took on a complex Indigenous sound often complemented by clapping boomerangs and clapsticks. 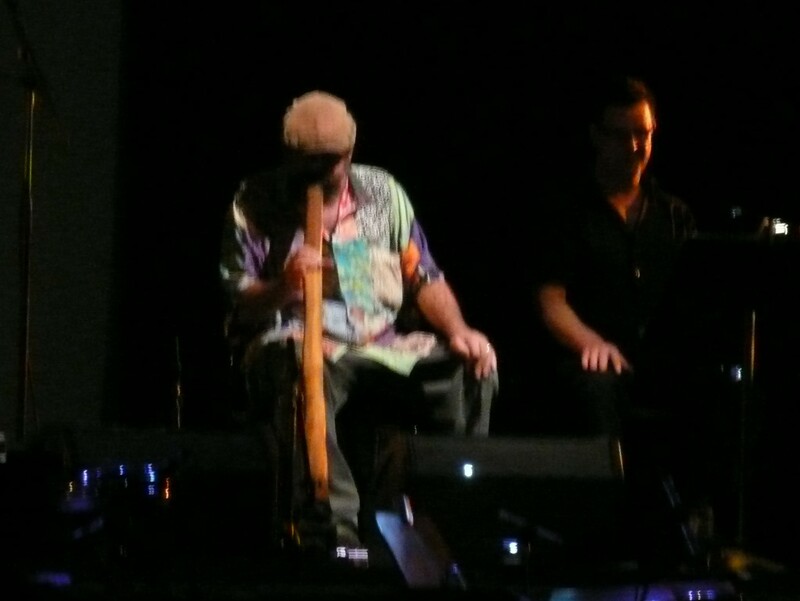 A segment by Will Barton on the didgeridoo was a virtuoso performance. The sounds evoked from that instrument were simply amazing and his skill, and lung capacity, blew me away. Another segment with a make-shift drum kit playing off against the traditional drums was intentionally humorous. 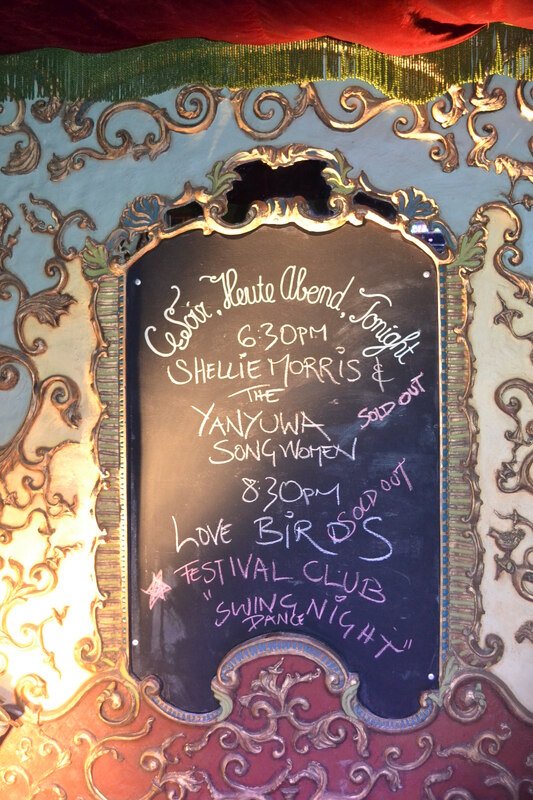 There were four women singing including lead female performer, Lou Bennet, and Darwin woman Shellie Morris. I especially liked the women’s segments for the emotion and richness of all their voices. Perhaps we were supposed to know each of the performers but I’d have liked to be introduced to them by name though I realise the focus was on the story of country and culture. 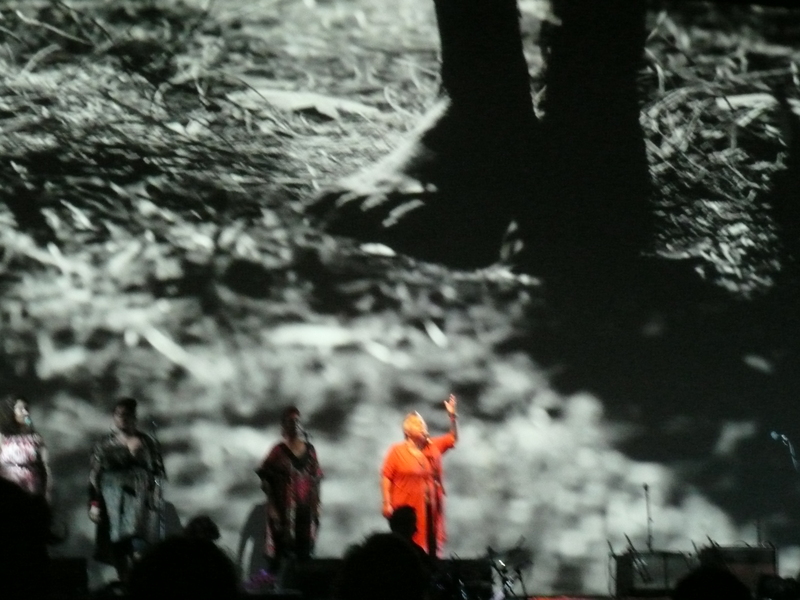 Throughout the show the backdrop of visual images from Indigenous communities, people and country complemented the music and the short titles in English were the clues to the stories behind the songs. It was special to sit under the stars listening to this music and see so many familiar images. One song was about the mango goose and fishing season. Just before the show started a flock of geese had flown over the Amphitheatre in formation: life imitating art or vice versa. As always the scenes of Aboriginal kids playing and dancing show their joie de vivre. I also found the focus on urban Indigenous people an interesting complement to the community images. There will be performances of Dirtsong in Melbourne in early September so if you are close-by you might want to consider heading off to see it. Sorry about the feeble photos but it was a bit difficult in the dark. 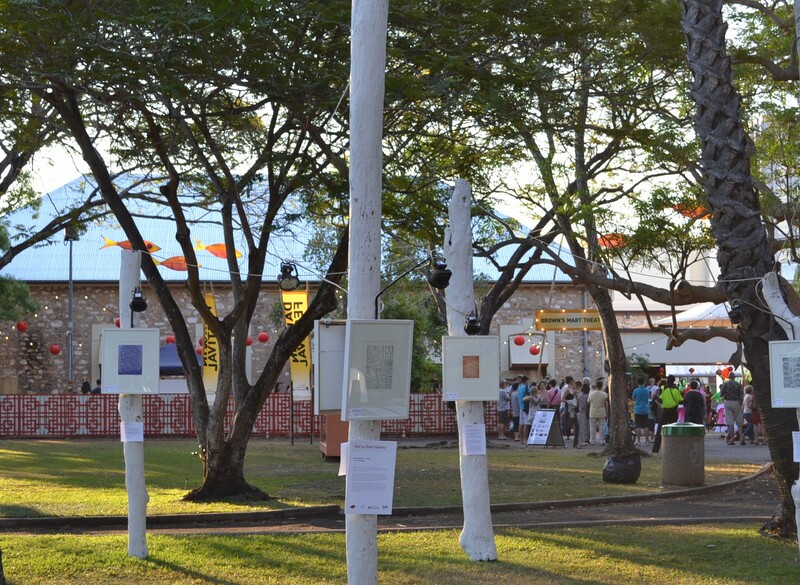 Each year in the festival grounds there is a display of art presented for sale. It looks so interesting with each painting positioned on a white-painted pole. 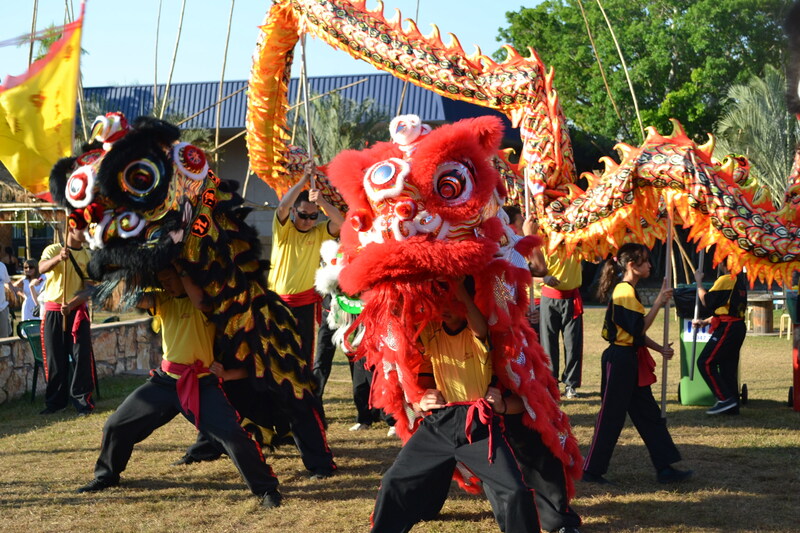 The Chinese community has a proud history in Darwin and the Chung Wah Society plays an important role in major events around town. 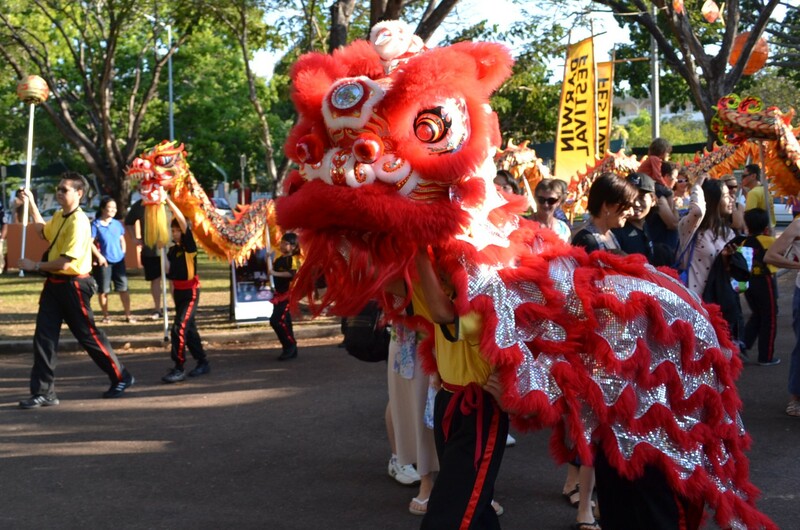 Last weekend Brown’s Mart was the focus on the Little China activities under the Darwin Festival banner. 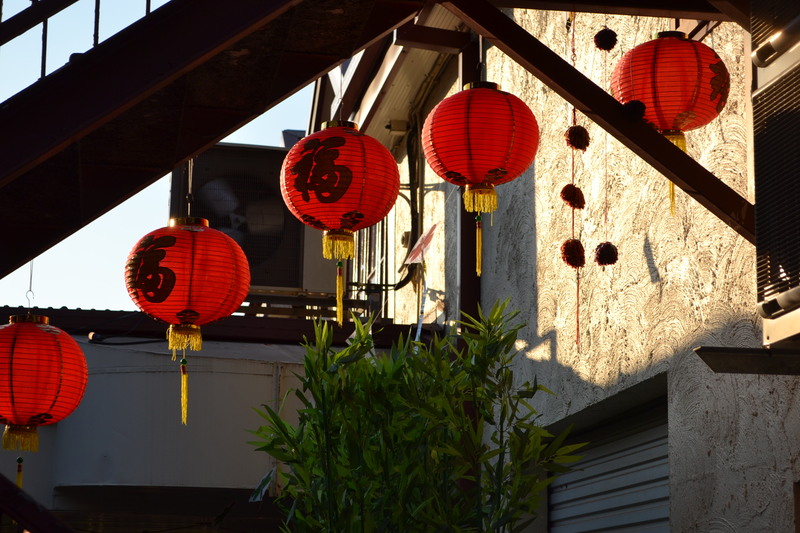 I loved the contrast of the red Chinese lanterns against the old stone buildings. 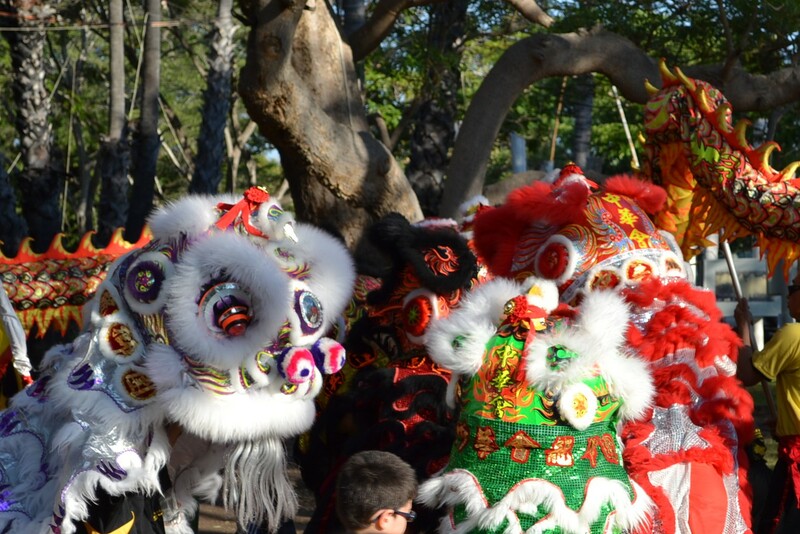 While the sight of Chinese lions is fairly common especially at Chinese New Year, I’ve never seen such a collection in one place before. It was really impressive and the grandchildren enjoyed the spectacle too. They’re cheeky too, and will come up to you and flutter their eyelashes and one of them head-butted me to get my (and my camera’s) attention. Even quite small children had a part to play in the festivities -and were pretty excited to get a free voucher to the fancy ice-cream shop after their performance. 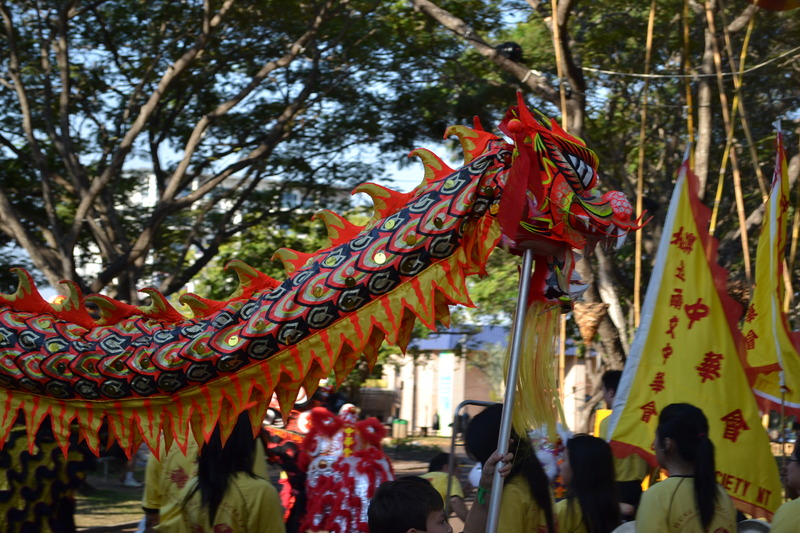 The Chinese dragon wound its way around the Festival grounds. 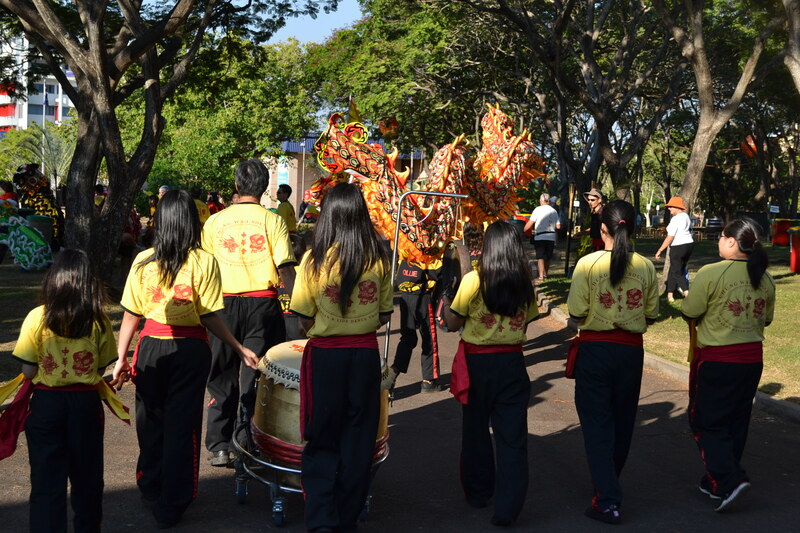 The sound of the musicians and drummers alerts you to the arrival of the lions and dragon. 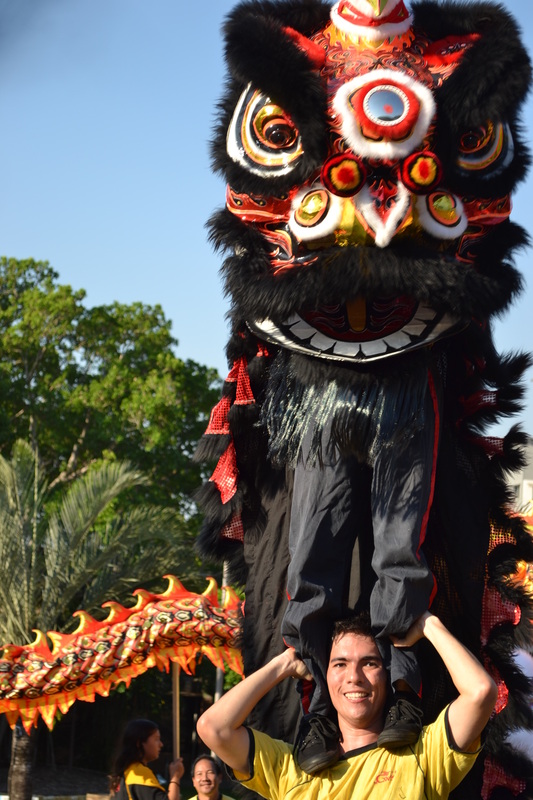 It’s definitely hard work being either half of the Chinese lion. Great work everyone! Thanks for all the fun. 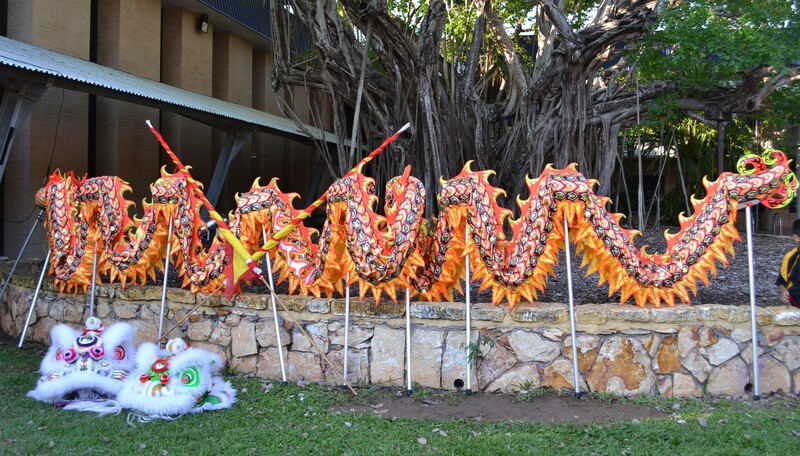 George’s Green in the Darwin Botanic Gardens is all blinged up for the Darwin Festival. 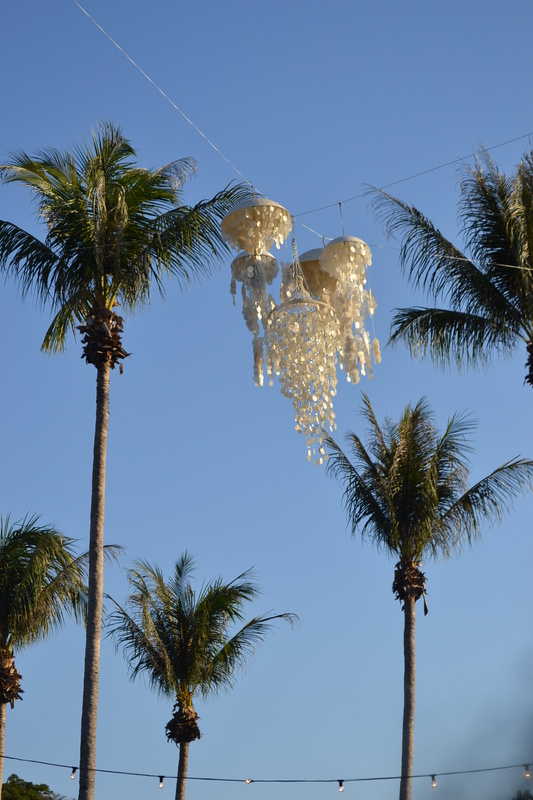 There are fairy lights, glittering glass chandeliers plus a Filipino cadiz shell chandelier. There’s outdoor seating and a small pub, plus take-away food options including the famous Hanuman restaurant’s offerings. With people milling and thronging before and after the concerts it’s abuzz, and a buzz! 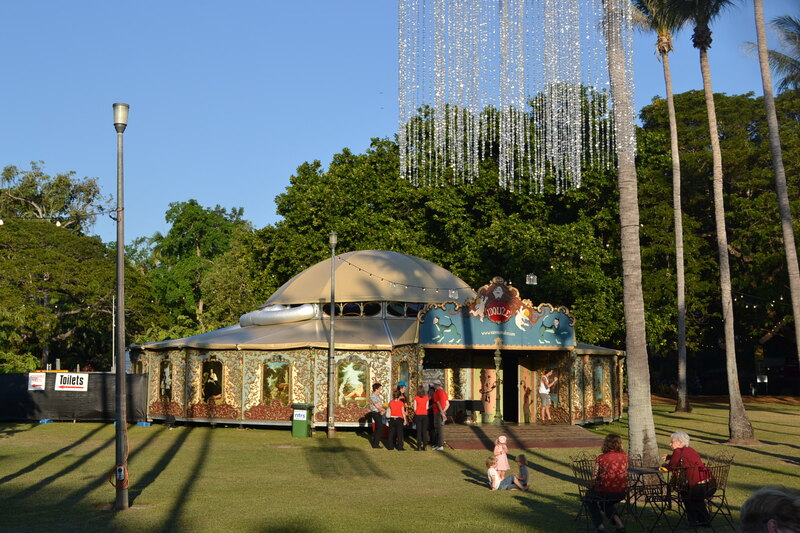 The Idolize Spiegeltent and George’s Green. 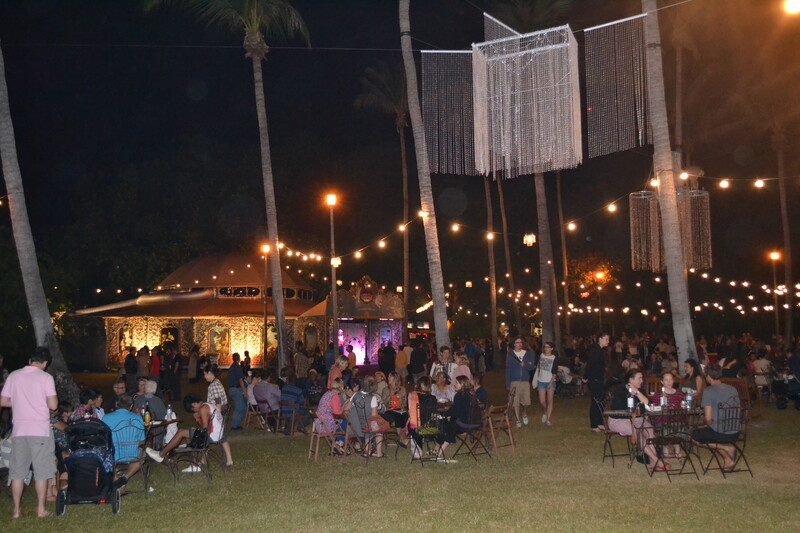 Small concerts are being held in a new temporary venue on the Green, the Idolize Spiegeltent. It’s really cool and rather than try to explain it, I’ll just include a photo or two. Larger concerts and some events are being held in the nearby Amphitheatre. As we sat there waiting for the venue to open to go into our first concert, an old Aboriginal bloke walking by asked me why I wasn’t smiling. I explained to him that I was tired but looking forward to the concert. He chatted for a while, explaining how he had been born a desert man but having lived in Darwin for a long time, he now felt like a saltwater man. He talked about one of the Indigenous singers who’d won an award the evening before and as he walked away, mentioned that he spoke 16 languages, no doubt most of them Aboriginal languages. Now I can be in thrall when someone is bilingual, but 16, that’s awesome. Yet there’d be plenty of people around town who’d see him and think he was a “dumb” blackfella but he’s the one speaking good English, bridging desert and saltwater cultures as well as whitefella ways. How myopic our own culture can be. George’s Green is abuzz with people. One of the great things about the Festival is that Indigenous performers are profiled for a wider audience to see and hear. Judging on last night’s concert (of which more anon), they’re either “preaching to the converted” or a lot of whitefellas are getting an Indigenous education. 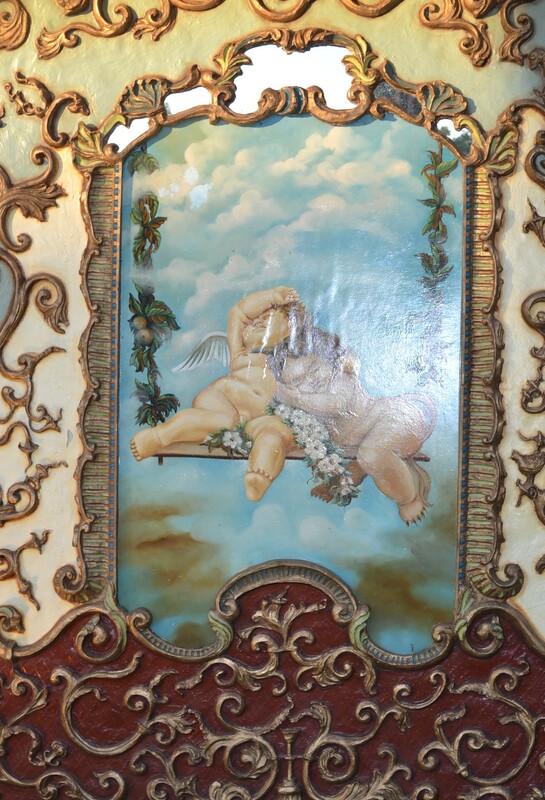 A detail of the putti/cherubs on the Spiegeltent, unfortunately the flash has reflected back a little. For a change of pace, today I’m posting about a fabulous concert we heard on Sunday evening. The performance was by Shellie Morris and the Borroloola Songwomen. 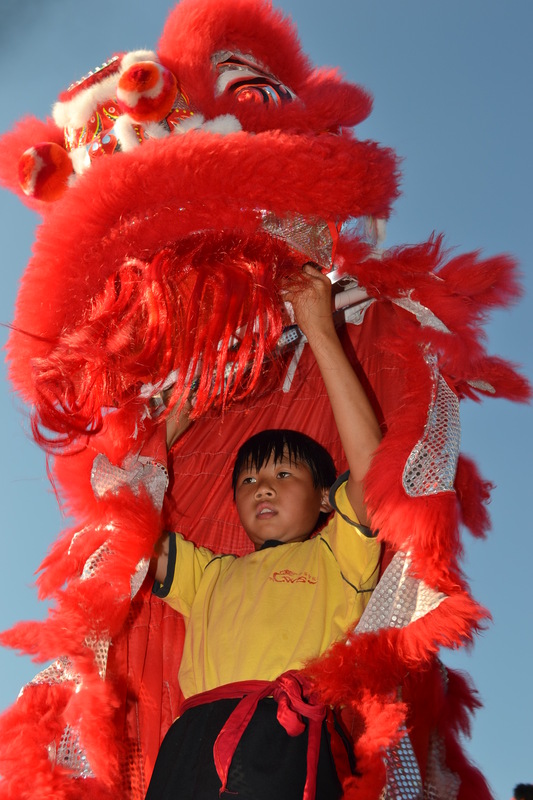 The women were all dressed in simple red tops and skirts with white headbands and feathers as well as ceremonial white painting on their faces and bodies. The group was introduced by Marlandirri McCarthy, herself a Yanyuwa woman, as well as a Minister in the current NT government. The audience was asked to stand for a minute’s silence to remember a family member of some of the group who had died in the last few days. It brings a whole new meaning to “the show must go on” when you know just how important sorry business is to Indigenous people. 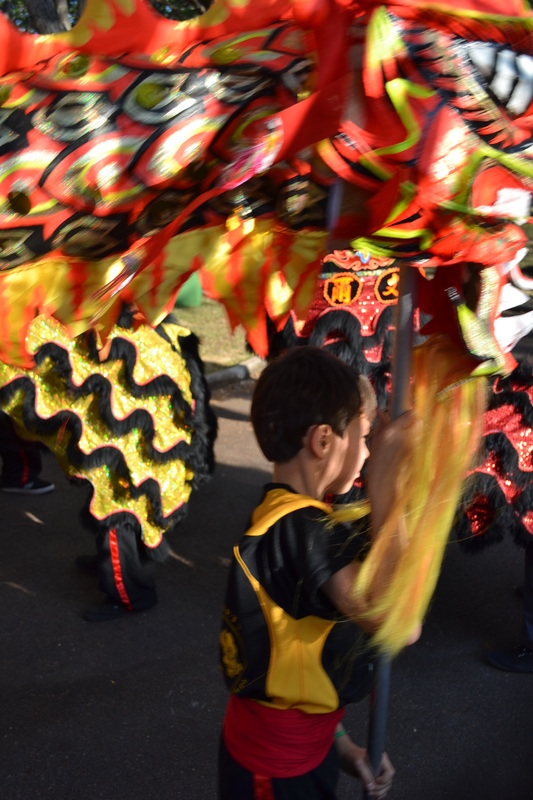 Hopefully the joy everyone found in their performance brought them strength from sharing their language and culture. Shellie Morris is an experienced performer who trained originally as an operatic singer. Her grandmother was a Yanyuwa woman but part of the Stolen Generations. Shellie has been welcomed back into Yanyuwa family and the complex network of family connections typical of Indigenous Australia. She did not speak language (the Indigenous language of the Borroloola people) but her family taught her words, the importance of culture and family, and translated her contemporary songs based on traditional culture. The rest of the group were initially less confident performing in public, though previously they’d been on stage at the Sydney Opera House. It seemed to me that once they realised they had the audience with them, they blossomed which was great to see. One of the ladies in particular took to it like a duck to water and really enjoyed engaging with the crowd. It was wonderful to listen to an entire concert sung in language (ie an Aboriginal language) and have the essence of the songs explained after the singing and dancing. The women’s pride in sharing this contemporary song about being Yanyuwa and saltwater people was evident. You can hear the women singing this song, Waliwaliyangu li-Anthawirriyarra a-Kurija at the Sydney Opera House on YouTube here. Please do listen to it: it brings me out in goosebumps and brought the audience on Sunday to a standing ovation. I absolutely loved this concert, and if you ever have a chance, do go and see a performance. You can listen to some of the songs from their CD album Together We Are Strong, Ngambala Wiji Li-Wunungu, on this site. And if you want to see the vast diversity of Aboriginal languages you can see an interactive map here. After the Songwomen concert, we had a popped in for a look at the Pesona Indonesia celebration at the nearby amphitheatre. 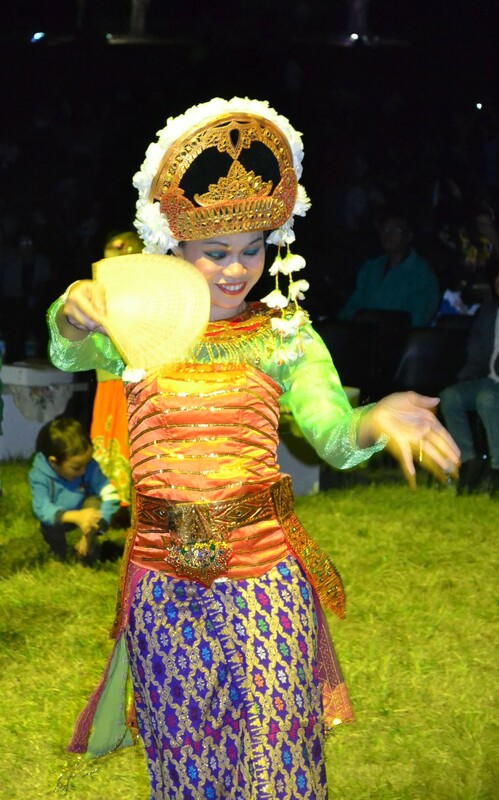 One of the dancers sharing her culture at the Pesona Indonesia celebration.